Las Glorias condo. Beautifully decorated with 2 T.V.s and 2 DVD players plus tape. One level. 3 bedrooms/ 2 baths, including den with trundle bed, which provide sleeping for 6 persons total. Most outstanding view in the condo complex of the harbor and the famous Tetakawi mountain. Sunsets are indescribable and hammock for relaxing ! 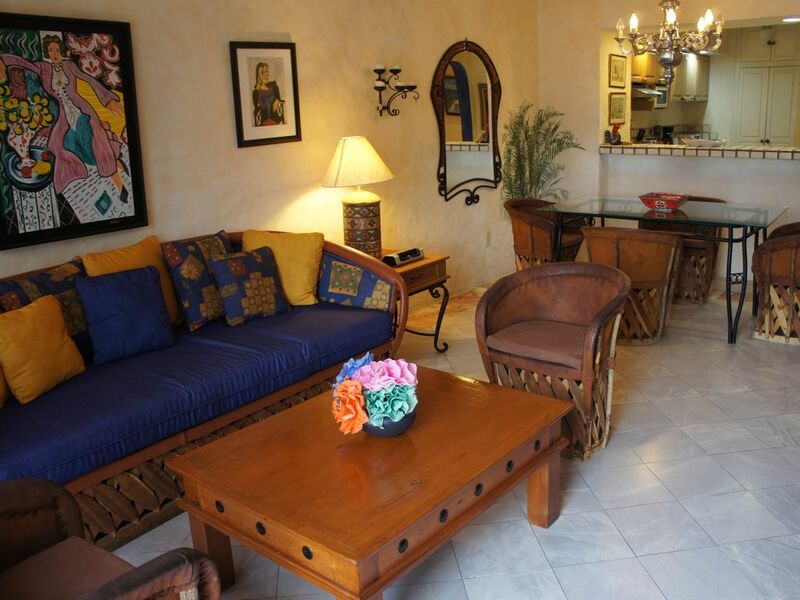 Este condominio de 3 recamaras y 2 banos, permite estancia para 6 personas y esta en el area de Las Glorias ubicada a un lado del Hotel Marina Terra, esta decorado estilo rustico Mexicano y de muy buen gusto, totalmente equipado, tiene DVD, TV con cable e internet del area. La vista a la Marina y el Tetakawi permite disfrutar de bellos atardeceres. El area cuenta con albercas, chapoteaderos, jardines y asadores con acceso electronico y privado. This place was awesome, calm and peaceful. Really enjoy staying here. recommend to everyone who really want to get away from all and regroup for few days. This was the first time staying at this condo. We were very happy with the condos layout, decorated nicely and it was spotless. The location was great, walking distance to many restaurants and shops. Will stay again, and refer it to friends also. Thank you for satying with us, we'll be happy to have you back soon. This unit was impeccable. Grand views of the pool and the facility. Very comfortable and would highly recommend all friends and family. Thank you for the opportunity to stay in your unit.